Colin: So...what'd you think [of Hogzilla's], Chef BoyarAndy? Chef BoyarAndy: I had high hopes coming in Colin...which normally sets you up for a let down. Not this time though. It was all I hoped it would be. Kinda like the first time I had Pappy Van Winkle bourbon or the first time I saw Boden dance. Did you have a favorite dish? Colin: I think I have your football in the back of the CCTV (Country Club Tailgating Vehicle, which we had driven to Dolphins game), btw. My car smells funny today. Shouldn't the restaurant just be called "Hogzilla"? I don't like that it's possessive. It's not owned by Hogzilla. I wasn't terribly hungry by the time we arrived at dinner since I'd eaten a decent amount of appetizers over at our warm-up at Chophouse, though that didn't stop me from trying most things we ordered as well as wanting to try several desserts. I'm also getting very hungry thinking back on the meal. I loved the cornbread with maple butter. The pterodactyl wings were just a little spicy, crispy and delicious, though somewhat standard fare. The sweet potater tots were a fun surprise. I'd get those again. I wasn't crazy about the pork belly chicharrones (misspelled "chicharonnes" on the menu, btw). They were very fatty and gristly and just aren't necessary when you're eating pulled pork and greasy sausage and stuff. The service was excellent. The owner stopped by several times to make sure we were enjoying ourselves. I probably liked the beer can chicken the most. I could eat the redneck tacos with beer can chicken like every day for a month probably. None of these have a place in describing the food at Hogzilla's. The food was tasty, creative, well-executed and memorable. They do have a place in describing my feeling toward the restaurant after a close inspection of my bill. $2 for "rocks?" $2 FOR ROCKS??? Any bourbon drinker will tell you that cheap bourbon is for mixing at college football games, good bourbon is excellent over ice and Pappy Van Winkle only touches the glass and your tongue. The words "Woodford on the rocks, please" come out of my mouth multiple times on any given weekend. Never have I had a bar or restaurant add a charge for ice. Notice they did it again on the Patron shots that my buddies visiting from DC had for dessert. Yes, they drink tequila for dessert. I'm sure somebody out there is thinking "they could just charge you $14 and you'd have never known". Not true...$11-$12 is the going rate for Woodford Reserve...it is $12 at Yardbird and Smith & Wollensky and $11 at Chophouse Miami. I'm mad. I'm mad that I feel taken advantage of. I'm mad that I can't give them an "Eat It" recommendation based on their food alone. I'm mad that a BBQ joint with a "not on South Beach" feel to it does something so shady. Maybe somebody at Hogzilla's will see this and change their policy...I truly hope so. P.S. Math tends to put things into perspective. My local mini-mart will sell you three 10lb bags of ice for $5. So for the $10 I spent on "rocks" I could have purchased 60lbs of ice. You could also look at it this way...they are charging you $8 per ounce for the bourbon, since their "rocks" charge is 1/6 of the bourbon charge that makes their ice $1.33 per ounce. That same 60lbs of ice we purchased earlier for $10? 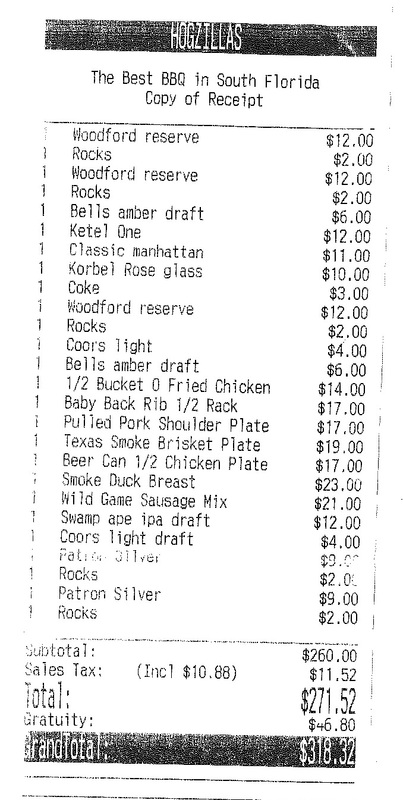 Hogzilla's just charged you $1280.00. Bartender's perspective: I have seen the rocks charge applied when one orders a whiskey on the rocks at establishments who are trying to wring every cent out of their customers (when I worked at Cameo we were instructed to do this- they also made us measure each shot exactly.) Otherwise, you would receive a measured shot of whiskey in a rocks glass with ice, which does not look like enough of a portion. You are supposed to get more liquor with this order. What is especially troubling here is that they did the same thing with the patron shots. Unless you ordered double shots, or patron on the rocks, that is erroneous bill padding, basically petit theft. I considered the "more liquor for a rocks pour" argument before writing this...and then I saw that they did it on the shots too. They ordered standard, run of the mill "shot of Patron, chilled" so Hogzilla's lost all benefit of the doubt from me at that point. The bottom line is, people looking for good BBQ and good Southern food probably shouldn't be looking on South Beach to begin with. The quality of the food is not at issue. The food is great at Hogzilla's. Literally the only thing wrong with the place was the "rocks" charge. That's the point of this whole review, Anonymous. Did you read it? I really wish we didn't have so many readers named "Anonymous." It's confusing. Maybe "Hogzilla's" is a contraction not possesive as in Hogzilla is Inspired Barbecue. Mr. Anonymous clearly has never eaten at Yardbird or Hogzilla's...both offer excellent examples of Southern food. I also agree about the "rocks" charge. I drink Crown. Sometimes with coke, sometimes "on the rocks" I find it hard to believe that someone wouldn't know the difference between a 1.5 ounce pour with a mixer and an "on the rocks" 2 ounce pour. EVERY restaurant/bar in miami will charge $2 more for a drink "on the rocks". hogzilla. dont be a stingy biotch. My name is Mauricio Valdes and I am the Food and Beverage Manager for Hogzilla's Inspired Barbeque. I would like to start out with a sincere apoligy for what you went through. Please note that Hogzilla's is not the type of place that bill pads or takes advantage of guests. In reading your post I can assure you that something like this will never happen again. I would like to start out with the "rocks" charge. The charge comes with a heavier pour of the chosen spirit and therefore you see a $2 charge. Now what really upsets me is the rocks charge for patron shots. Under no circumstances should you have been charged rocks for shots! I would like to think that my staff would not ever do this to one of our guests. Unfortunately it did and I will be getting to the bottom of this. I would like to get in contact with you in order to make this right by you because once again we are not that type of establishment. Please e-mail me at mauricio@hogzillas.com. I would like to know who that server was in order to correct this issue. Furthermore I will be doing a refresher to the entire staff about the proper way we do things at Hogzilla's and our policy and procedures. I've forwarded your comment along to Andy. He'll likely be emailing you. Thanks for following up. So I emailed Mauricio with Hogzilla's but never heard back from him. Curious, this. And this is why I don't go out to eat much. It's costs us al kee holics WAY too much!